On 21 March 2017, Jamie is holding a huge fundraising event called the CEO CookOff. The night will see 30 leading chefs join forces with the UK's top business leaders, to cook a banquet for hundreds of everyday heroes – as a thank you for their work in schools and hospitals across the country. The money raised will be shared between Jamie's Food Foundation and charity UKHarvest, to combat food waste, obesity and malnutrition. You can donate to the cause here. In the run-up to the event, we're taking a closer look at the challenges faced by our food system and looking at some exciting new innovations to tackle the problem as well. The following is an extract from an article written by Tristram Stuart in May 2016, an expert on the environmental and social impacts of food production for Jamie's Food Revolution. "My personal food revolution began when I was 15 years old. Living in rural Sussex and looking for a way to make some pocket money, I bought pigs to rear and sell pork. I fed them in the most traditional and environmentally friendly way: scraps from the school kitchen, stale bread from the local baker, and surplus from farms whose potatoes were the wrong shape or size for supermarkets. I realised that most of the food I was giving to my pigs was in fact fit for human consumption, and that I was only scratching the surface of the food waste problem. All the way up the food chain, from farms, factories, supermarkets and our homes, we as a society are haemorrhaging good, fresh, edible food on a colossal scale. At university, I continued my activism as a freegan – eating perfectly good food that had been discarded in supermarket bins. I did this, not because I needed to, but because I was incensed by our insanely inefficient and wasteful food system. It was a way of protesting against the shocking amount of food waste whilst enjoying the simple, delicious solution – eating it rather than throwing it away. Between 2005 and 2009, I researched food waste around the world to learn why and how food is wasted, publishing the findings in my book ‘Waste: Uncovering the global food scandal’. What I uncovered was alarming. Even as 1 billion people struggle to put healthy food on their plates and feed their families, globally we waste over one third of the food we produce from farm to fork. Even in high-income countries like the UK, almost 25% of the population is at risk of poverty or social exclusion and over a million people have been helped by food banks. Yet food availability in rich countries represents 150-200% of nutritional needs. Food production is also the single biggest impact we have on the environment – deforestation contributes to climate change and biodiversity loss, methane from livestock farming is a highly potent greenhouse gas, fertilizer run-off produces nitrogen blooms in oceans, and heavy amounts of water, fuel, and other energy inputs are required for farming. We are not just wasting food but all of the resources used to produce it and the climate change implications of leaving it to rot. Yet there is a positive movement. People across the globe are using their creativity and love for food and the planet to fight food waste. Feedback, the environmental non-profit I founded, fosters collaborations between these passionate individuals and organisations to take back control of the food system. Our campaigning work fights food waste at every level. The Pig Idea campaigns to lift the EU ban on feeding catering waste to pigs. The Gleaning Network rallies volunteers and food redistribution charities to salvage fresh fruit and vegetables from farms across the UK and Europe, whilst we fight for farmers who incur the burden of this waste due to supermarkets cancelling orders at the last minute or rejecting produce due to cosmetic standards. But perhaps the most well-known of our campaigns is Feeding the 5000. It’s a one-day food festival that raises public awareness about food waste, elevates the conversation around food and sustainability policy, and champions the easy, fun and tasty solutions. At each event we serve up a delicious meal for 5,000 people, made entirely from fresh, top-quality ingredients that would have otherwise been wasted. The free feast is served alongside activities such as cooking demonstrations, tastings, smoothie and juice making, and talks by local and national leaders in the space. 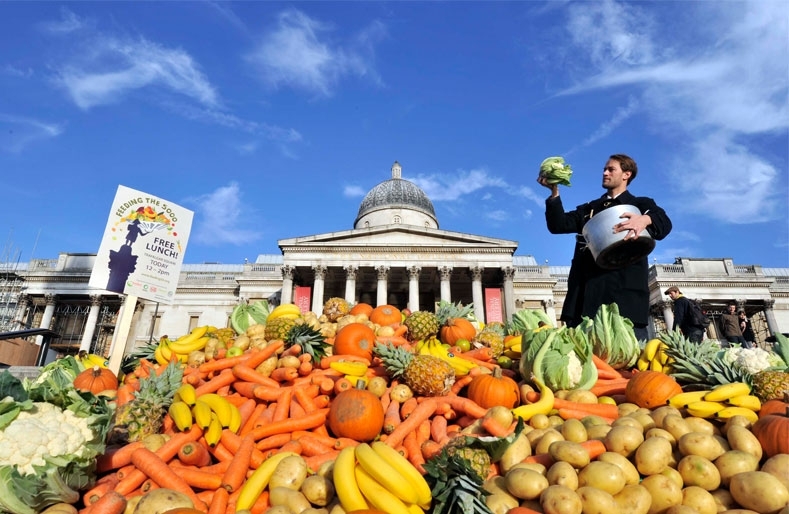 What began as a one-off event in London’s Trafalgar Square in 2009, bringing together a coalition of environmentalists, chefs, and anti-hunger organizations, and linking them to supermarkets and restaurants with surplus, has expanded into a global campaign that has touched every inhabited continent." Find out more about Tristram and the work of his organisation Feedback here. Toast Ale, the craft beer social enterprise founded by Tristram, is crowdfunding. They brew beer with surplus fresh bread and give 100% of profits to the charity Feedback to end food waste. Be the first to get your hands on their new Craft Lager and Session IPA by pledging your support here.